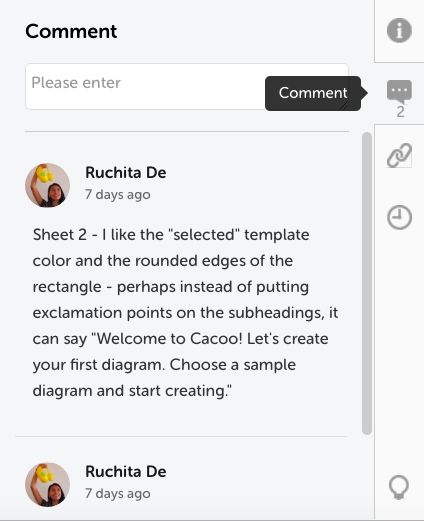 Let’s get to know the collaboration tools in Cacoo, so you can easily locate and share your best diagrams. After you make your first diagram you might wonder, “now what?” If you’re a member of our Team Plan, it’s likely that you’re working with other people within an organization, which means you will eventually need to show your work to someone else and collaborate with others working on your team. Here’s your guide to getting the most collaborative power out of your Cacoo account. When you have a Cacoo for Business plan, you are given access to both a Private and Organization space for creating your diagrams. You control everything about your Private account, from your settings to who can see your diagrams. Not even your organization’s administrators can manage the diagrams you make under your Private account. Your Organization’s space, on the other hand, is contributed to by all employees with a Cacoo account, and ultimately controlled by the organization’s administrators. Diagrams created here can only be shared amongst the organization. Unlike the Organization’s account, Private accounts default to the basic access of the free plans, allowing you to create six diagrams and export to PNG*. However, even if you create your diagrams on your Private account, you can still reap the benefits of your Organization’s account and switch between the two seamlessly. *You can upgrade to our paid Plus plan for more personal storage. When establishing your Cacoo workflow, you can decide whether you prefer creating new diagrams directly in your Organization’s space or creating them in your Private account first and then moving them to your Organization once they’re ready for review. 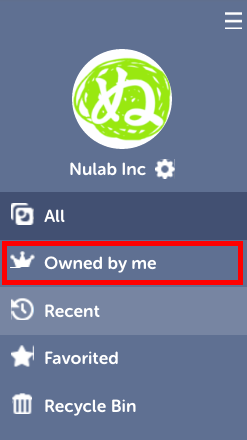 To switch between Private and Organizational spaces, you can click either your Nulab Account icon in the left menu or the tab in the header and make your selection. 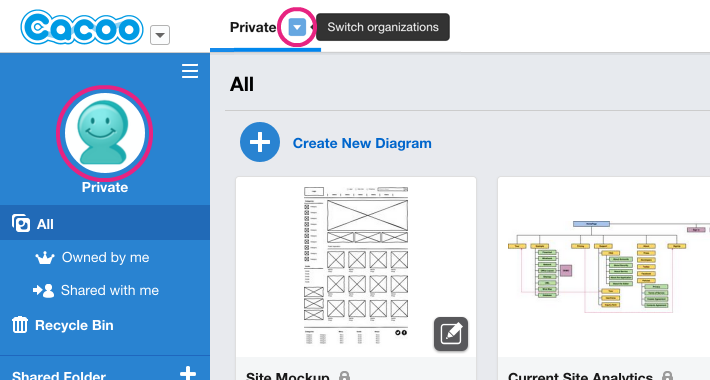 Helpful Tip: Not sure if you’re currently in Private or Organization view? If you see your name and icon in the left menu, you are viewing your private diagrams. 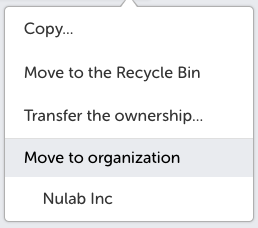 If the organization’s name and icon are shown, you are viewing the organizational diagrams. If you belong to multiple organizations, all organizational icons will be shown. You’re going to want to familiarize yourself with the “Diagram Action” button. When you click it, you will see a number of options, including one to “Move to organization,” underneath which you will see a list of all the organizations you are a member of. When you want to make a diagram available to your whole team, just click the organization where you want to move the diagram. Then select the project you want to house it in. 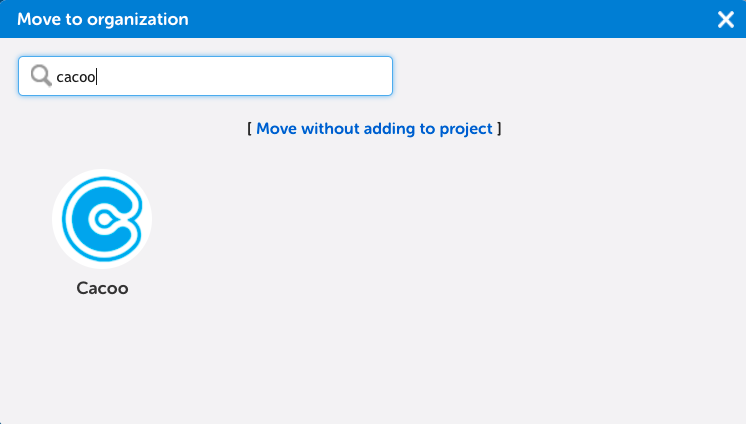 You can search projects by keyword using the search box. 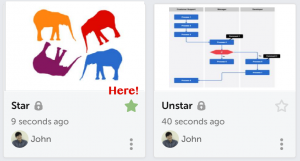 Select your project, and your diagram will move from your Private account into your Organization’s diagrams where your team can now view, comment, and/or edit your diagram. To locate specific diagrams, use the search icon in the upper right to filter diagrams by owner, keyword, or diagram type. Whenever you view a diagram that you expect to use a lot, make sure to add a star to it to add the diagram to your “Favorited” list which you can then access using the left menu. You can also use the “Recent” list to view only your most recently opened or edited diagrams. If you’ve opened it in the Diagram Detail page or editor in the past two weeks, it will show up in this list. Your organization is likely divided into multiple teams all working on their own set of specific tasks. Keeping all your diagrams in one shared space is going to lead to some pretty rapid overcrowding. To organize your diagrams more effectively across teams, you’ll want to organize work by Projects. 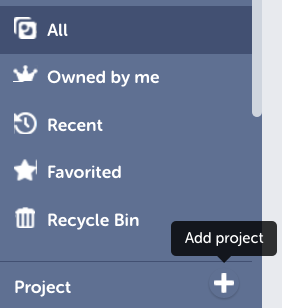 To create a new project, just click the “Add Project” icon in your left-hand menu. When you’re ready to give feedback, double-click any diagram to open it in the Viewer, which will allow you to view and comment on the diagram without directly editing it. Click the comment icon in the right-hand panel, and you’ll be able to review others comments as well as leave your own. 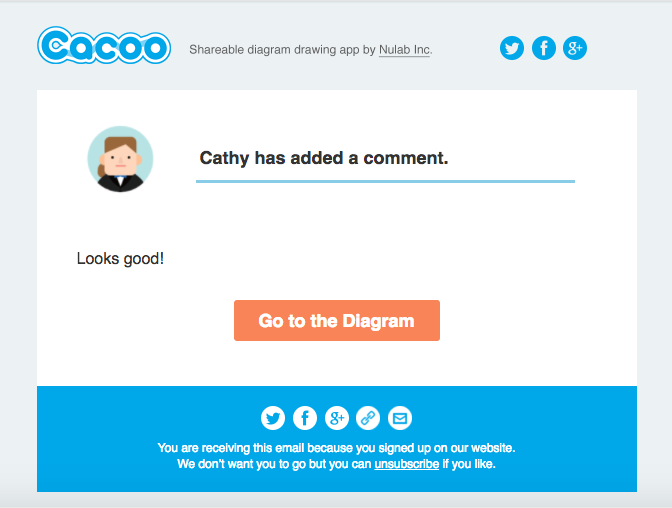 The best part of our commenting feature is that every user collaborating on a diagram is notified by email everytime a new comment is made on the diagram. Click on the link in the email, and you’ll be redirected to your diagram where you can find all your helpful comments. 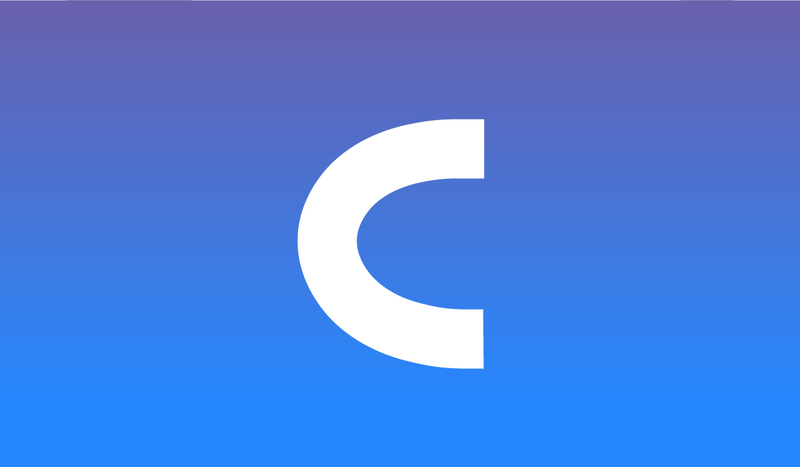 You and your co-workers no longer have to create a separate dialogue to notify each other every time someone gives their feedback. 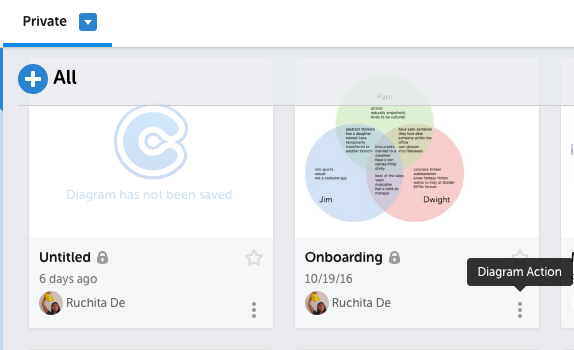 With Cacoo’s collaborative features and shared workspace, you and your coworkers will be creating beautiful diagrams together with ease.